The Russian word “дядя” may translate in English as the word “uncle,” but to a native Russian speaker, it actually has a much larger cultural connotation. How does one impart these subtleties to student learners? 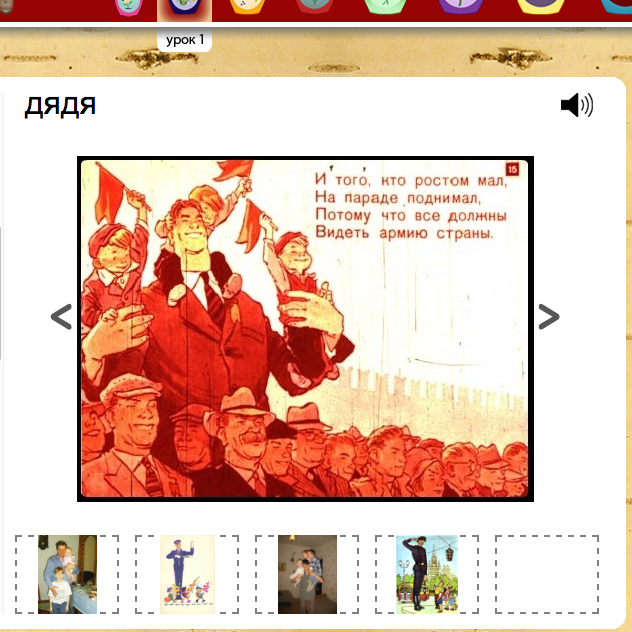 Taking a new and bold approach to second language acquisition, Slavic Languages and Literatures Senior Lecturer Elisabeth Elliott realized with technical assistance from the MMLC, a new kind of visual dictionary for students of first year Russian. Rather than learning vocabulary by means of translation, which might impart an culturally inaccurate impression of the word, the Intercultural Dictionary presents vocabulary in a culturally relevant visual context. In 2008, Hewlett Summer Intern Yana Myaskovskaya developed not only an appealing aesthetic for the site, but also imparted a high degree of technical accuracy for its contents, thanks to her knowledge of Russian. Since then, five units of content have been added to the dictionary.